This year we aren't using a full-fledged reading curriculum; our reading instruction comes from books that we read in our everyday life. Books like Miss Rumphius and Mr. Popper's Penguins which Progeny Press offers literature guides. Our move to reading trade books was a natural progression because reading in our home is just like eating or picking up after one's self. It's somewhat of a habit. We don't read picture books as much as we used to ( I really miss it) because our read aloud books are normally chapter books, and the girls are reminding me that they aren't babies anymore. But, thanks to Progeny Press for introducing us to Miss Rumphius, we read a picture book last month in conjunction with the e-guide. Miss Rumphius by Barbara Cooney shares the story of the Lupine Lady who upheld her promise to her grandfather to one day contribute in making the world beautiful. Progeny Press offers an in depth literature guide for this picture. For the review of the guide, I received a downloadable PDF file. The guide is separated into several sections including Before You Read Activities, three sections regarding the text, and After You Read Activities. If you have never used a Progeny Press guide before, then you should know that their guides are faith based which is evident in the questions which are asked of the learners. In the "Before You Read" section, we were led to numerous Scriptures that focus on making plans such as Proverbs 16:3 and James 4:13-15. There were also activity suggestions that could be started as a prelude to the book. The three main sections focused on the book, Miss Rumphius. Each section included vocabulary activities to help the learners build understanding of the words chosen in this particular text. Other than vocabulary, geography, questions about the story such "Alice has grown up now. What do people call her? ", and questions about the artwork. Since this is a picture book, there are also instructions for completing an art project similar to the artwork in the book. How did we use the e-guide? I downloaded the guide and printed copies. We read the story together and the girls completed some of the questions alone followed by us discussing their conclusions. The guide is very straightforward, and I found that many of the questions were fine for us to discuss aloud without them writing down all of their responses. Since this book is written for early elementary students, I knew that it would be simple for our fifth grader, but I still wanted to see her responses to direct questions since we aren't using a reading curriculum. The questions were written at a level that was fine for our third grader. I found that the biblical components were my favorite from the guide. I believe that I can see Him in all things even those things that aren't written for the sake of faith. 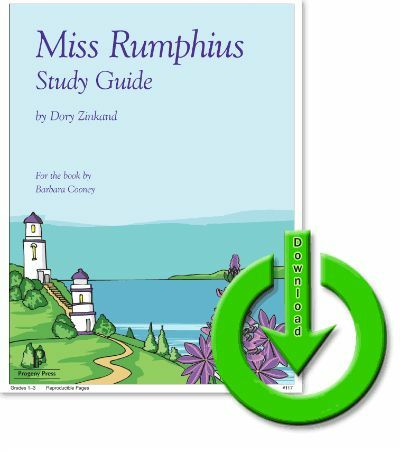 The Miss Rumphius e-guide is sufficient for a lower elementary student. It isn't written for an upper elementary student although I did include my fifth grader somewhat, but it truly wasn't necessary. She did enjoy the story though.